Last week, I had the opportunity to attend the Amazon Re:Invent conference in Las Vegas. Over 13,000 people took over the Palazzo for deep dive technical sessions to learn how to harness the power of Amazon Web Services (AWS). This show had a much different energy than other enterprise software conferences, such as VMworld. Whereas most conferences feature a great deal of selling and marketing by the host, Amazon Re:Invent was truly more of a training show. Cloud architects spent a lot of time in technical bootcamps learning how AWS works and getting certified as administrators. That is not to say that there was no selling or marketing going on; the exhibition hall featured myriad vendors that augment or assist with AWS deployments and solutions. The focus on the deep technical details, though, does point out the fact that we are still in the very early days of the cloud. Most of the focus of the keynotes was about getting compute workloads to the cloud – there was not a lot of mention of moving actual data to the cloud, even though that is certainly beginning to happen. But, that is how the evolution goes. IT departments need to be comfortable moving workloads to the cloud as they begin to leverage the cloud. Building this foundation is also important to Amazon – the goal would be for many companies to completely outsource the IT data center. It is important, however, to proactive plan for information management as more workloads and, importantly, data move to the cloud. As the internet first emerged, companies dove into new technologies like email and network file shares only to create eDiscovery nightmares and make it virtually impossible to find information within digital landfills. It is key to learn from those mistakes rather than to repeat them when leveraging cloud-based technologies. In order to ensure both that end-users are happy with search experiences on data in the cloud and that Legal can do what they need to do from an eDiscovery standpoint. This means providing business workers with unified access to email, files, and SharePoint information regardless of where the data lives. It also means giving Legal teams fast search queries and collections. But, Cloud search is slow, as indexes live far from the information. This results in frustrated workers and Legal teams afraid that eDiscovery cannot be completed in time. The solution to a faster search is a cloud-deployable search application, such as X1 Rapid Discovery. This creates a win-win for Cloud providers and customers alike. As enterprises move more and more information to the Cloud, it will be important to think about workers’ experiences with Cloud systems – and search is one of those user experiences that, if it is a bad one, can really negatively affect a project and cause user revolt. eDiscovery is also a major concern – I’ve worked with organizations that moved data to the cloud before planning how they would handle eDiscovery. That left Legal teams to clean up messes, or more realistically, just deal with the messes. By thinking about these issues before moving data to the cloud, it is possible to avoid these painful occurrences and leverage the cloud without headaches. At X1, we look forward to working closely with Amazon to help customers have the search and eDiscovery solutions they need as more and more data goes to AWS. 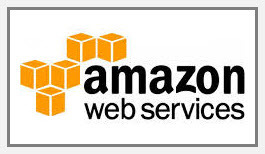 On June 27, Amazon Web Services (AWS) will be hosting a first of its kind webinar by a major cloud provider addressing the topics of eDiscovery and enterprise search. Per AWS, the webinar will explore solutions that allow organizations to quickly search, identify and act upon distributed data, whether it resides within the enterprise or within the AWS cloud. Vikram Garlapati, an Amazon Web Service Solutions Architect, will lead off the discussion. 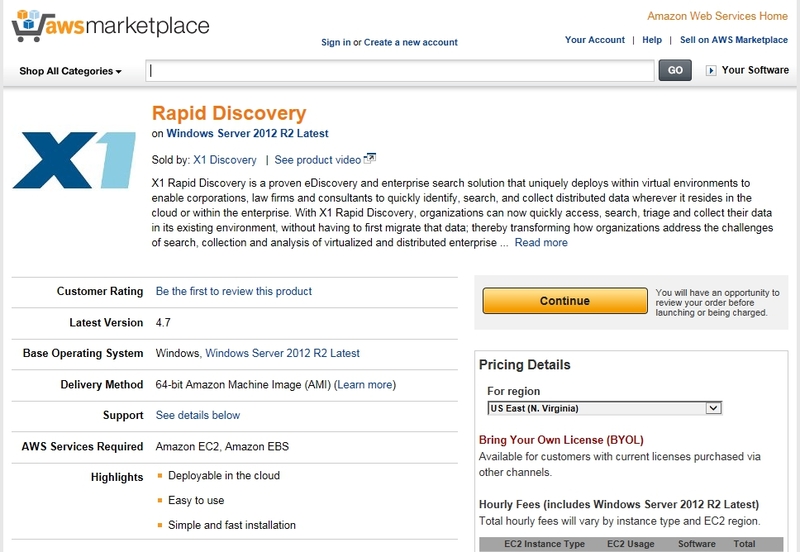 This is the first time, to our knowledge, that Amazon will be publically addressing eDiscovery in the cloud and featuring a solution like X1 and also the first time they will be featuring a third party enterprise search solution to enable search within the IaaS cloud. While SaaS hosting of eDiscovery services and some limited enterprise search capabilities by a vendor from their own servers is not new, this webinar will effectively be addressing a very different topic: deploying search solutions for eDiscovery and business productivity into an organizations’ public cloud instance where their data resides. This allows instant and lightning fast indexing, searching, and review of that data in place without having to first export that data out of its native cloud environment. Also presenting will be LTech CIO Eric Klotzko. LTech is a cloud systems integrator and AWS partner who is a major proponent of next-generation enterprise search and eDiscovery solutions that install and operate in virtual environments. Eric will underscore the limitations of traditional enterprise search solutions that are hardware appliance-based or require an extensive manual on-site install process, thereby rendering such solutions as non-starters for deploying into and operating within virtualized cloud deployments. Judge Peck told the story of a Chief Information Security Officer who had authority over e-discovery within his multi-billion dollar company who, when told that the company could enjoy significant savings by moving to “the cloud”, questioned whether the cloud provider could accommodate their needs to adapt cloud storage with the organization’s e-discovery preservation requirements. The cloud provider said it could but at such an increased cost that the company would enjoy no savings at all if it migrated to the cloud. Having just visited Amazon Web Services headquarters office and meeting with several key senior managers, it is clear this issue is a priority for AWS. This is precisely the reason why we developed X1 Rapid Discovery, version 4. 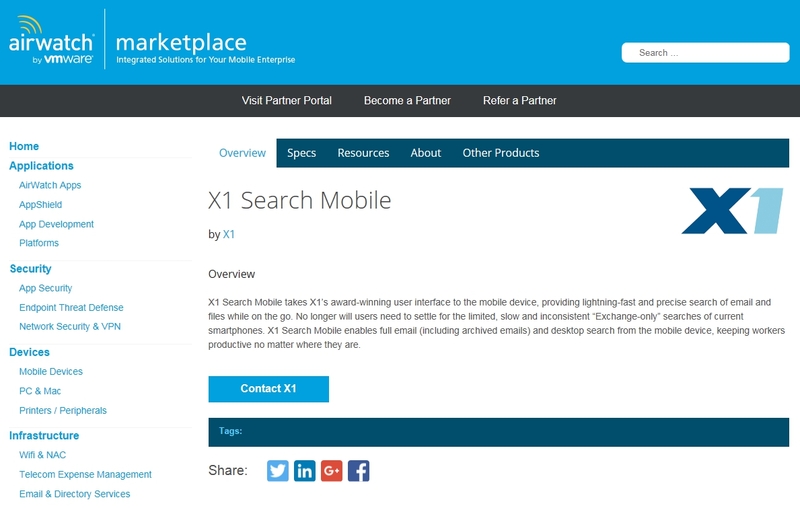 X1RD is a proven and now truly cloud-deployable eDiscovery and enterprise search solution enabling our customers to quickly identify, search, and collect distributed data wherever it resides in the Infrastructure as a Service (IaaS) cloud or within the enterprise. As far as the major cloud providers, the ones who choose to solve this eDiscovery challenge (along with effective enterprise search) with best practices technology will not only drive significant managed services revenue but will enable a far more rapid adoption of cloud computing. Please stay tuned for more exciting developments in this next frontier of eDiscovery and enterprise search. 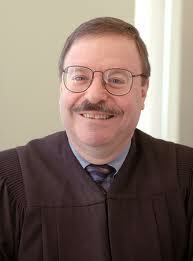 Federal Court Magistrate Judge Andrew Peck of the New York Southern District is known for several important decisions affecting the eDiscovery field including the ongoing Monique da Silva Moore v. Publicis Group SA, et al, case where he issued a landmark order authorizing the use of predictive coding, otherwise known as technology assisted review. His Da Silva Moore ruling is clearly an important development, but also very noteworthy are Judge Peck’s recent public comments on eDiscovery in the cloud. In previous posts on this blog, we outlined how significant cost-benefits associated with cloud migration can be negated when eDiscovery search and retrieval of that data is required. If an organization maintains two terabytes of documents in the Amazon or other IaaS cloud deployments, how do they quickly access, search, triage and collect that data in its existing cloud environment if a critical eDiscovery or compliance search requirement suddenly arises? This is precisely the reason why we developed X1 Rapid Discovery, version 4. X1RD is a proven and now truly cloud-deployable eDiscovery and enterprise search solution enabling our customers to quickly identify, search, and collect distributed data wherever it resides in the Infrastructure as a Service (IaaS) cloud or within the enterprise. While it is now trendy for eDiscovery software providers to re-brand their software as cloud solutions, X1RD is now uniquely deployable anywhere, anytime in the IaaS cloud within minutes. X1RD also features the ability to leverage the parallel processing power of the cloud to scale up and scale down as needed. In fact, X1RD is the first pure eDiscovery solution (not including a hosted email archive tool) to meet the technical requirements and be accepted into the Amazon AWS ISV program. As far as the major cloud providers, the ones who choose to solve this eDiscovery challenge (along with effective enterprise search) with best practices technology will not only drive significant managed services revenue but will enjoy a substantial competitive advantage over other cloud services providers.